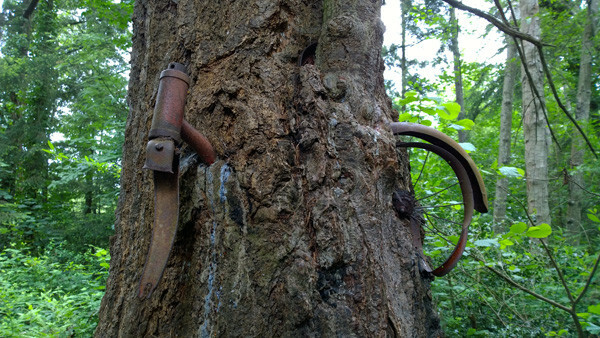 The famed "Bicycle Eaten by A Tree" tucked in the woods right off the Vashon Highway on Vashon Island, Washington. We have all seen this picture on the internet a thousand times. 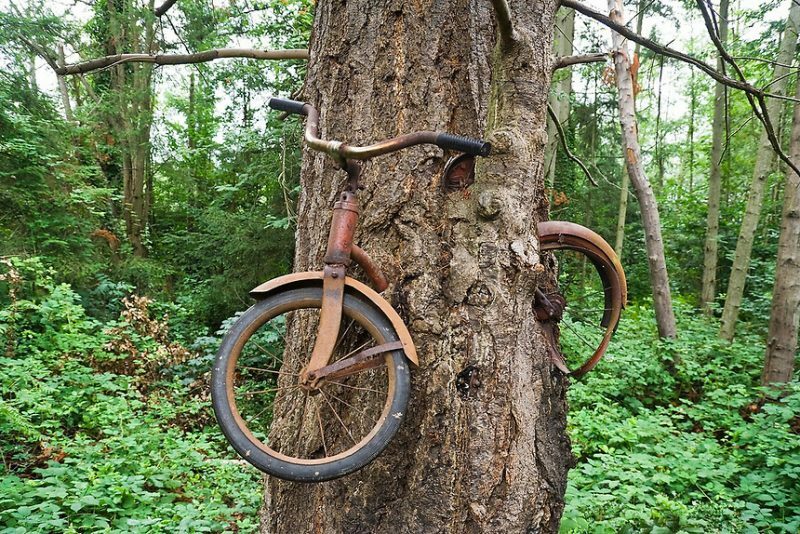 A tale of a lad that went off to war and left his bike against a tree. He never returned from the war so his parents left it there as a memorial. We know this story, right? You have to love the internet for its eccentricities and this story is another example (remember the catfish that swallowed a Nazi?). The headline itself is the biggest clue – the USA did not enter WWI in 1914. It entered in 1917. They also never sent boys off to war – looks like a 10 years-old bike. Furthermore – this isn’t a bike from the early part of the 20th century. So lets have a look at the real story behind this picture. Vashon Island Bike Tree.We don’t have to go back to 1914 for the beginning of this story – in fact we just have to go back to the 1950s. You see, this is a bike from the 1950s and it belong to an 8 years-old boy called Don Puz. According to The Seattle Times. 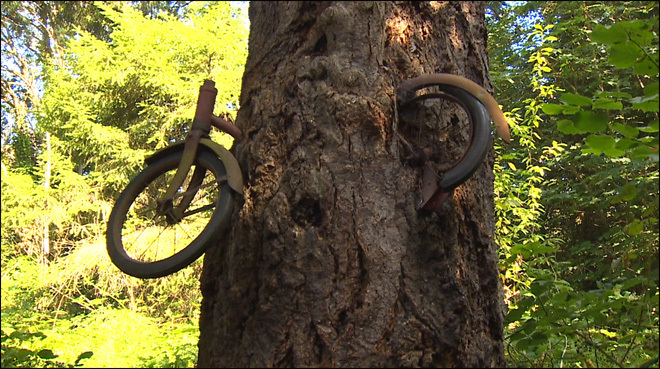 The story of how the bike came to be in the tree is told by a retired King County deputy sheriff, Don Puz, who now lives in Kennewick. The only bike he rides now is a stationary one. He grew up on the island and lived here until 1992. Puz tells how, in 1954, his dad died in a house fire, leaving his mom with five children. The island came together and donated various items to get the family going again. Among those items was a bicycle for young Don. “I never liked the bike. It was like a tricycle, but with two wheels. 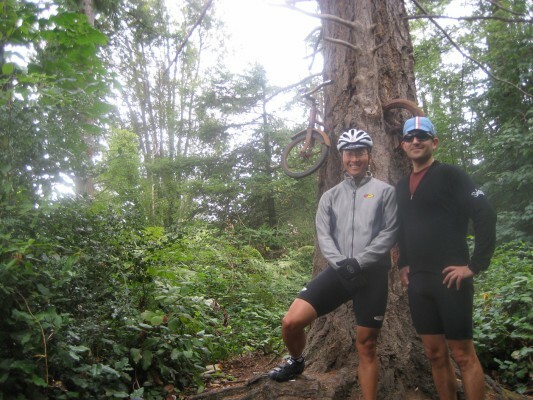 It had hard rubber tires and skinny little handlebars,” he says. Puz says eventually the family moved to a home near what became Sound Food, but which then was a swampy area. “We liked playing there, catching polliwogs. We’d get into ponds and mud. It was a good place,” he says.Sometime in the mid-1950s, says Puz, he forgot the bike in that swampy acreage and never bothered to get it back. Good riddance. It has now become a major tourist attraction and also a target for souvenir hunters and very littler remains of the bike. Local are trying to keep it alive by replacing the stolen parts but it is getting harder and harder to find replacement parts for a bike this old. How the bike ended up in the tree probably wasn’t a case of a young fir sapling growing under the bike and swallowing it, says professor Elizabeth Van Volkenburgh, of the University of Washington’s Department of Biology.“That bicycle would have been too heavy for a young tree,” she says. More likely, says Van Volkenburgh, when the tree was older, “somebody hung that bicycle on the tree. A spokeswoman from Loch Lomond and the Trossachs National Park said: “The mature sycamore (Acer pseudoplatanus) has significant cultural and historic heritage which is recognised locally, regionally and nationally. The Park Authority says a tree preservation order would protect the tree in the event of any future change in land use in the area.